We are building a Kitchen Table Vignette from the ground up! 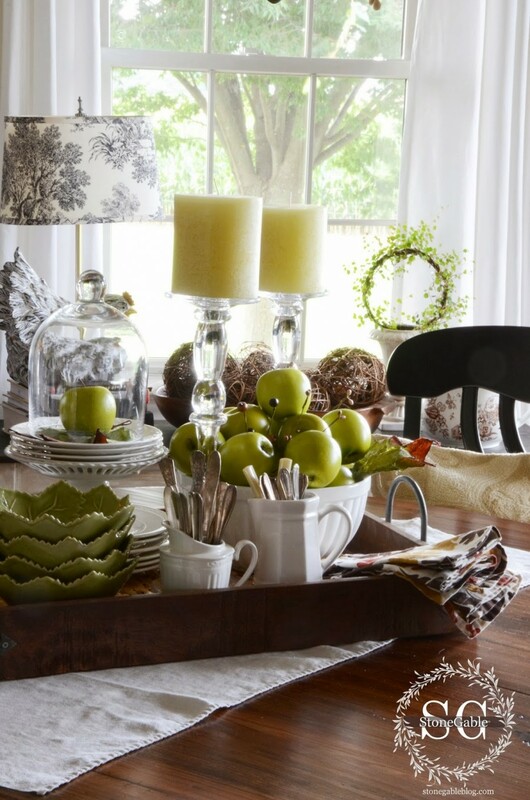 I think a vignette looks best anchored to the table by a table runner. A runner brings a little soft texture to a vignette. Now, that I have said that… I do break this rule. I sometimes like the hand hewn texture of my kitchen table and find it works with certain kitchen table vignettes. But in most cases a runner looks the best! In this early Fall Kitchen Table Vignette I used a piece of vintage French linen as a runner. 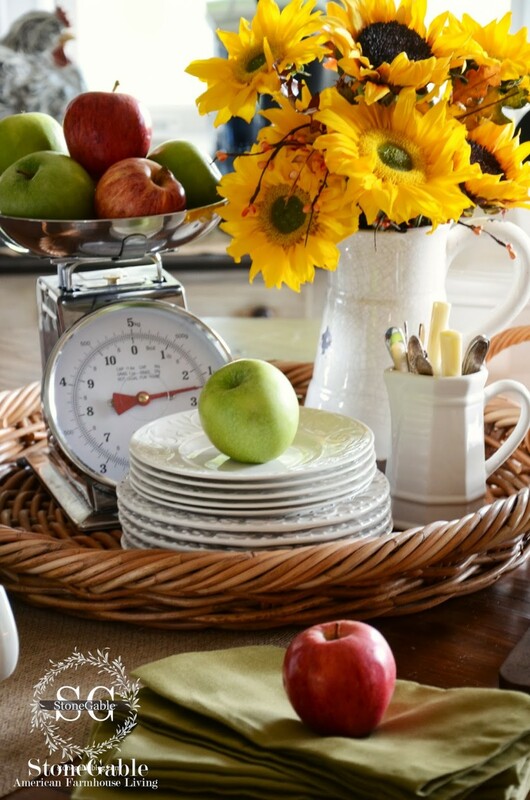 Create a focal point for a kitchen vignette by using a large basket, tray or any big piece. Place the most important items in it. Other supporting pieces can be placed around it. I corralled all the pieces of this easy summer vignette inside a large round basket I found at HomeGoods. Now’s the time to pull out lots of dishes and bowls and pitchers and great pieces from your kitchen cupboards! 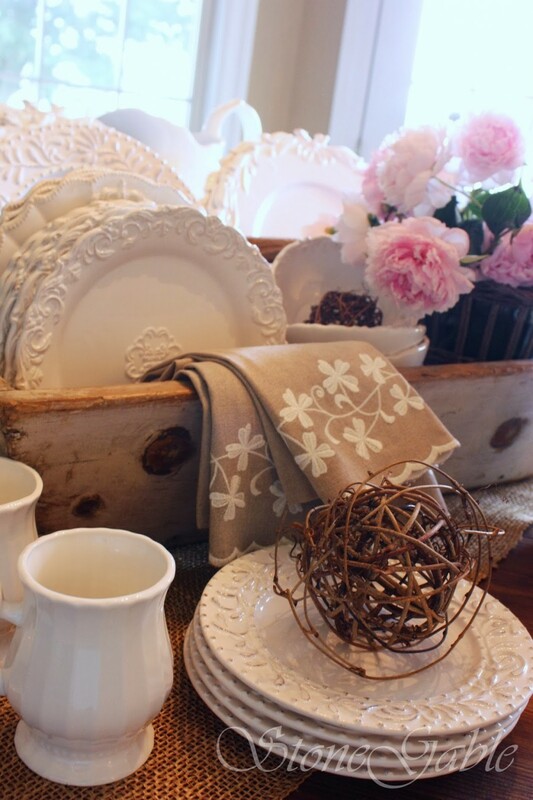 In this early spring Kitchen Table Vignette I used several patterns of white dishes. I wanted to create a soft look. Use kitchen objects and food as part of your Kitchen Table Vignette. 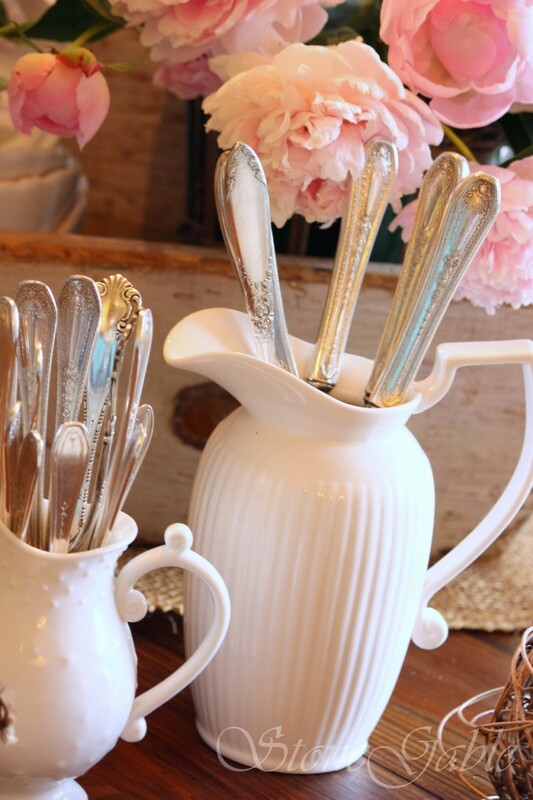 In almost every Kitchen Table Vignette I use small pitchers filled with old silverware… I just love the look! 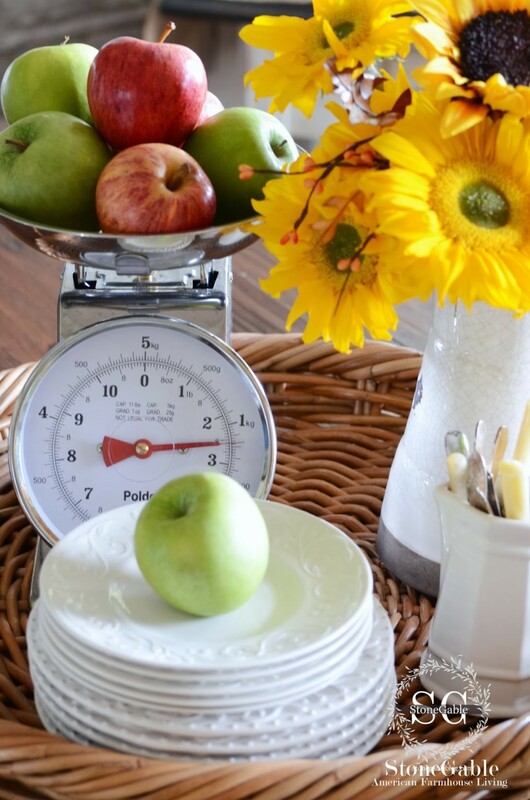 In this early fall vignette I used my kitchen scale filled with apples. Don’t forget to use things like sticks and twigs, napkin rings, willow balls, small pictures, fun objects, candles and candlesticks and seasonal decor. Really you are only limited by your own imagination! 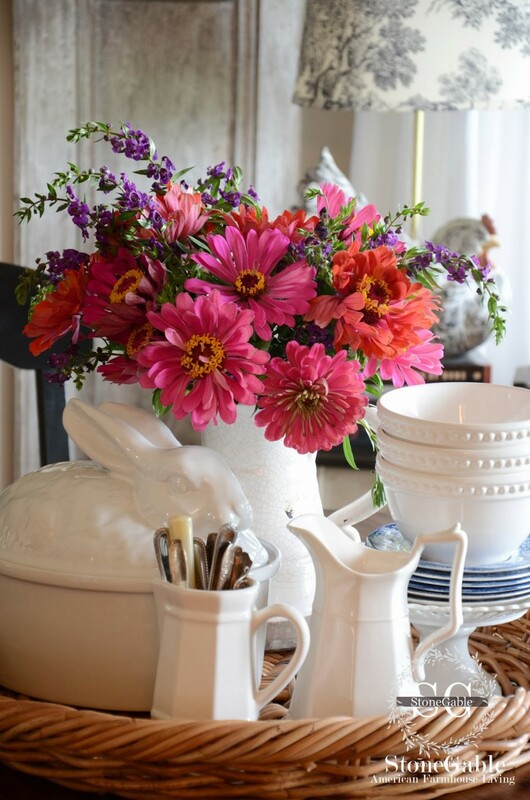 Some of my favorite things to use are… cloches, large bowls, pitchers, napkins and soup tureens! Fruit, veggies and pumpkins are food favorites! Varying the heights in a Kitchen Vignette will make it a whole lot more interesting! 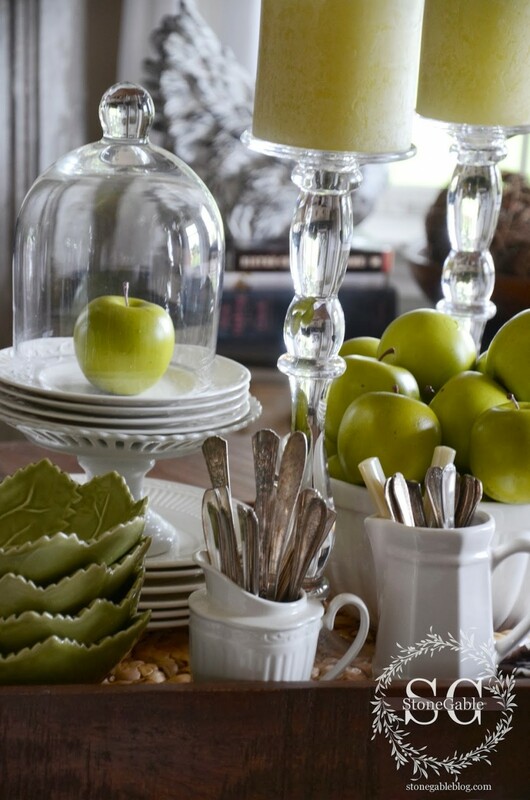 Stack dishes, use small pedestals or cake plates, employ tall candlesticks to be part of the vignette! Having a piece that stands out and catches your eye is very important. For me this usually is something seasonal! Flowers or seasonal fruit are my go-to’s! 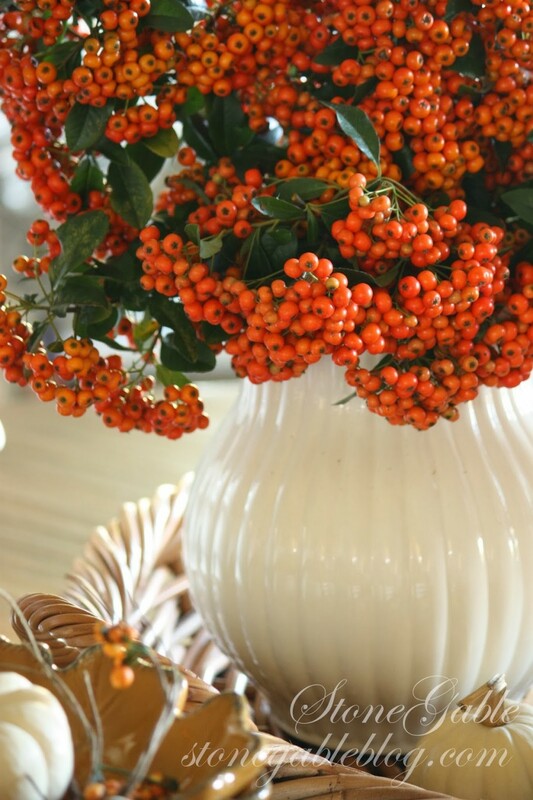 In this fall Kitchen Table Vignette, I cut a big bunch of bright orange pyracantha from our bush outside and put it into a large white pitcher. This arrangement is a show-stopper and begs for attention! * Practice! 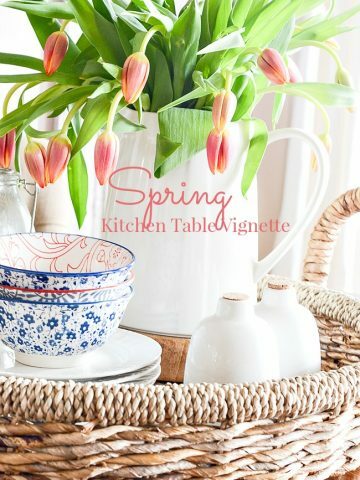 Spend time playing and having fun creating a Kitchen Table Vignette! *Don’t be afraid to mix colors. My style is not as colorful as some. But if you like color, then use it! *Even lowly and inexpensive grocery store flowers make a great focal point! 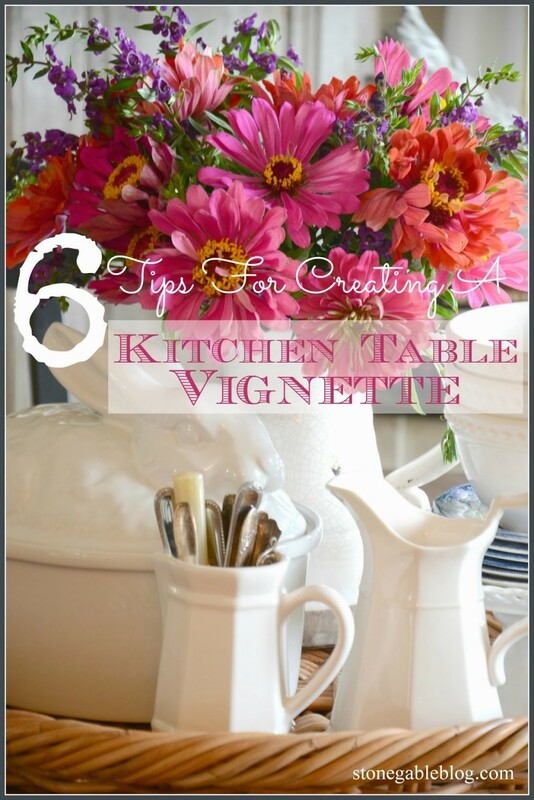 Now let’s pull out those dishes and other things to make a great Kitchen Table Vignette! Do you receive StoneGable’s newsletter? I create it myself. It highlights daily posts and those archived that would be seasonal relevant and interesting. It updates you on all things StoneGable. To get it in your email look for a grey box on my right sidebar near the top that says…KEEP IN TOUCH. Enter you email address and click! Remember to pin this to your Pinterest TABLESCAPING or KITCHEN or DIY boards. You can follow me and see all the great things I am pinning HERE! I love these beautiful ideas. I just adore the vintage cutlery. I recently found some silver plate and pearl handle cutlery belonging to my grandma. I have displayed it in a vintage jam crock. My heart sings when I see it. I so admire how you effortlessly blend new, vintage and thrift finds to make a beautiful and cohesive space. Thank you for sharing this. Glad you found me too! I have been busy today and just had time to sit down and relax. I find myself wondering “was is Yvonne up to today”! I do enjoy your posts and reading the comments. Thanks for sharing a part of your life and talents. Have a lively week. I cannot tell you how thrilled I am to have found your blogs. I feels as though God led me to you at just the right time. Personal and health issues have led to severe burnout and the discouragement regarding the house is overwhelming. You’ve restored the creativity in me with your philosophy of keeping changes slow and simple while remembering to have gratitude regarding your home. You are just the inspiration and motivation I desperately need. Thank you for your posts! Oh Kathy, we all go through those times, even me! I’m thrilled you are being uplifted, inspired and encouraged by StoneGable. That was the purpose I write! I love this, so beautiful. Thanks for the tis. Yvonne, you are so talented and have an amazing eye. I love that every time I stop by I learn something new. Whether it’s gathering pics, learning balance, or reminding me about texture, I am gathering a wealth of information to beautify my home. Thank you for showing us how to create beautiful vignettes. Like you said ..Practice makes perfect…Well you are right! I studied very carefully your vignettes and some of my other favorites bloggers and now I too am pleased with my vignettes.I did a Winter scape in front of my Mom and she said..You did that so fast and look how lovely it is..I thought to myself…Thank you Yvonne for showing me how to put everything together in a lovely creation. How nice! And you are so so welcome! I am looking for a rabbit tureen. Where can I purchase one? Thank you for all your beautiful ideas. I love the vignette ideas here! I actually have the very same rabbit thirteen featured and have never thought of using it in this way. Love, love, love!!! ****tureen not thirteen. Autocorrect ugh!? 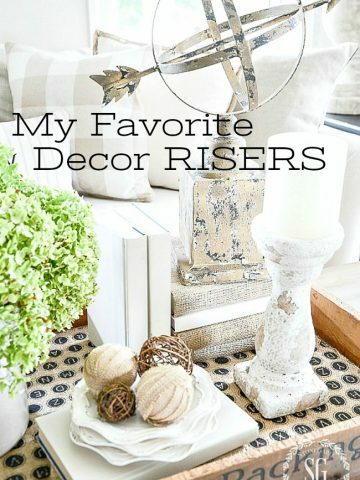 I love all the vignettes you featured in this post! Love all of your ideas Yvonne! Keep up the blogging. I sit back at night, lift the tired legs and soak up your suggestions. So nice to hear, Joanne! Hugs! Your white dishes are fabulous. Where did u get them? Hi Joy! I get them when I see them. I love to hunt at HomeGoods and TJ Maxx. Thanks for your creative ideas and giving me guidance on decorating. MiMi, Welcome to the StoneGable family! 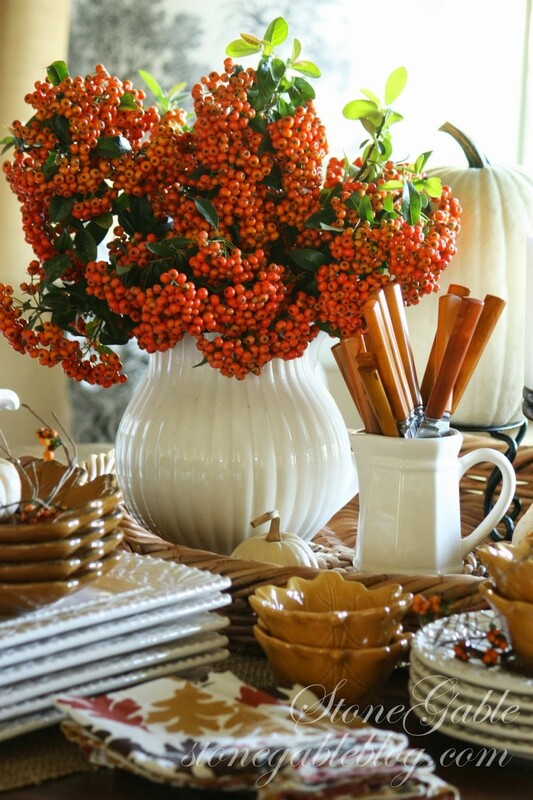 Your table vignettes are so lovely! You have inspired me to do something different with my kitchen table! I have been searching for a white footed cake plate that is around 8-9″ wide and about 5″ tall. Do you have any suggestions as to where I might find a small one like that? I am SO glad I found your blog! Thanks for sharing your decorating style and talent with us. You inspired me! It is time to put away the pinecones. I am going to “shop” my decorative stash this afternoon! Fun! ok…have to ask… i just love the plates with the heavy trim. on this page they are behind the pink flowers and also in front at the top heading with ‘winter 2015’. Are they available anywhere? thank you! I think Yvonne may have purchased them fairly recently. You might want to scroll thru some of her posts from the last few months if she doesn’t reply. I like them also. Great post, again, Yvonne! When I see your “old silverware” displayed I think I see “Queen Bess” pattern! That was my first silverware when I was first married. My hubby used to say: “I have eaten more Cheerios than I ever want to see again.” as mine were a premium for General Mills boxtops. I recently found some in an antique store in California for $1.00 a piece…I grabbed up a bunch…added them to the U.S.Army Medical Corps. silverware (I guess he pilfered from the mess-hall), and display them with such memories! Thanks for your inspiring posts. Greetings, does anyone know where i can find the decorative/french country dishes under the “use lots of dishes” quote. I adore them and i’ve been searching but I cant find anything like that! It’s always hit or miss, but I’ve found the dinner plates, bowls, mugs and a couple of platters at Marshall’s on different occasions. I check every time I’m there. Your vignettes are always lovely, thanks for the tips! Wonderful tips, and beautiful photos, Yvonne! I particularly like the one about having one big “WOW!” focal point. We have a relatively small counter-height breakfast table, and corralling an assortment of pretty things in a low-sided basket is the best and almost only solution to creating a decent vignette that doesn’t take up too much space. You are a vignette artista Ivonne, this post is fabulous, so much inspiration, I love them all! 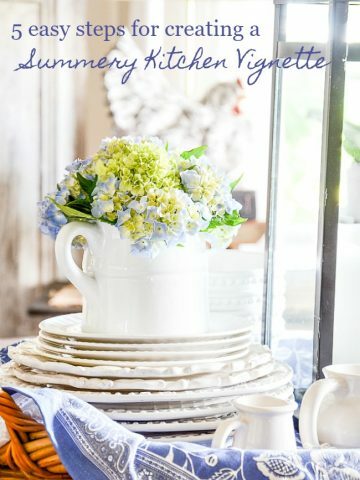 I am in the process of doing a “vignette” for my dining room hutch and you are inspiring me all the way!…Gorgeous and perfect vignettes always! I absolutely love all your beautiful embossed white dishes. Are any of them current patterns that can be purchased easily? Do you have some favorite stores you buy them in? If so, would you mind sharing the store names so your readers can watch for similar dishes in the future? Thanks Yvonne. Sharon B. This post is exactly what I needed. I have found some great new pieces of transferware recently and I have been trying to find new ways to display them. I am excited to get started! You always inspire me. Thanks for all of the great ideas! Lovely kitchen table vignettes, dear friend!!! You have a “gift” for putting gorgeous buffets together. and look forward to continued inspiration in the future from StoneGable! Like everyone else I love your vignettes, but your kitchen is my favorite room! I enjoy visiting it when ever I stop by which is every other day or so….oh no I am not stalking, just can’t stay away. Your posts never disappoint me. Ok off to do my own vignette. Great tips! All of your vignettes are gorgeous! Such inspiration you always give us, Yvonne. It is almost Spring here in Houston…today 70f. Tish is going to be in NYC for a book signing on March 10th, can you come? I’m going to be there, so is Francine & Tina. Everything looks beautiful. Thank you for the tips — it always amazes me how beautiful and professional you can make a vignette. Wonderful post Yvonne! You always have such beautiful vignettes! Gorgeous! Great tips! Love your white dishes! this was real timely for me. and really helpful. I pinned 3 pictures to remind myself and others to read this post when creating vignettes. I love all your vignettes! I’m wondering, what size baskets, boxes, etc. you use on the table to contain the vignette? Could you give us ideas of things to use? Yvonne, I always admire your vignettes. Thanks for sharing the tips. You’ve inspired me to create a vignette using dishes for our sideboard. I’ve said it before and I’ll say it again…..you should write an entertaining book featuring your lovely table setting and food ideas. You really are a master! Thanks for the tips ! Beautiful !! Beautiful post Yvonne. I love seeing all of yous fabulous dishes and gorgeous bouquet of flowers on such a dreary day! Thank you!! Oh Yvonne you inspire me so. I adore you calm, elegant style. Especially your table scaping that I can’t seem to get enough of. 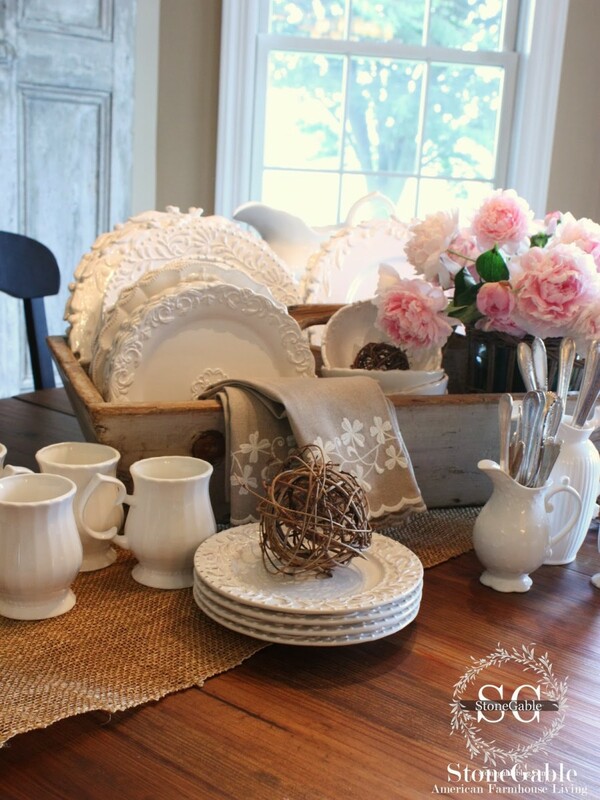 Love seeing your wonderful ideas for your table and counters, your white dishes just lend themselves to any pretty holiday or seasonal grouping! Great tips. 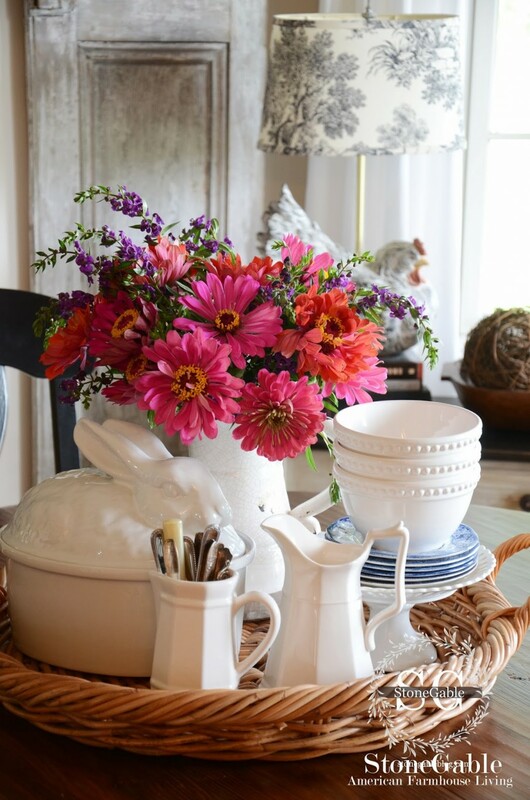 I love creating vignettes and especially at the kitchen table! Perfect tips and beautiful photos. Such a nice post I love all the flowers. I love this post! 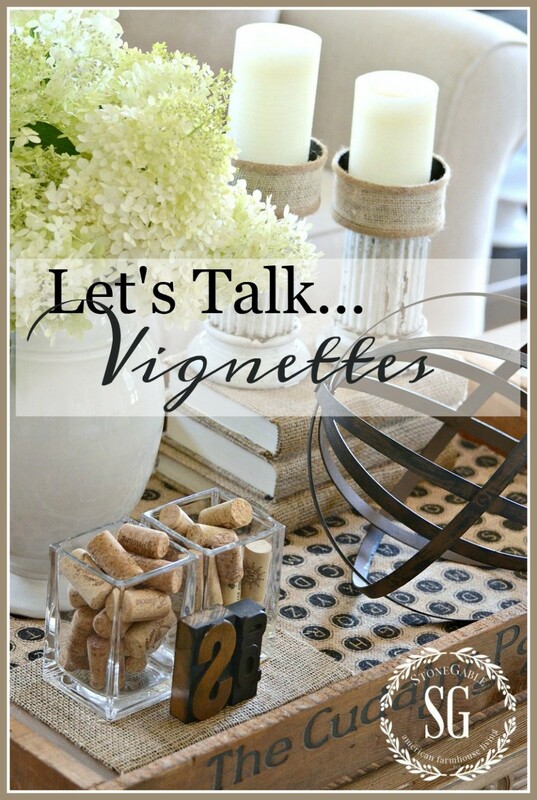 Great tips from an expert on creating vignettes!! Your ideas inspire me so much! I love them. Thank you! Great tips, Yvonne! Your vignettes are always so beautiful. I love to see the flower arrangements you put together. I also love how you use white dishes in almost all the vignettes and they all look unique. Thanks for stopping by yesterday with a sweet comment on my Kit Kat Piano Cake. So nice of you to leave a kind word. Hope your week is going well. I always like your vignettes! I did try to pin it, but it didn’t work. Great post Yvonne. I’m going to do one TODAY!!! It’s a snow day in Nova Scotia and I need a pick-me-up with some colour!! Thank you. Pinning as well. Thanks, Susan! I hope you share YOUR vignette! loved this post! Great tips anyone can use! You have inspired me to create a new vignette for my table today!